You're doing well for yourself in life. You've done this by working hard, making the right calls, a bit of luck and spending your money wisely. Now you want a car which shows this, but a Mercedes, Audi or Jaguar seems a bit much, a bit too ostentatious. The luxury brand premium doesn't seem justifiable. An SUV seems like more of the same. In this situation, your options are the cars you see here, the all-new for 2019 Toyota Camry, the Volkswagen Passat and the Skoda Superb. The Superb is a known quantity, having been around for some time now. The Passat is a close relative, but as we see later, charts its own path. The Camry, a universal favorite but now with some added zest. But which one's most suited for you? All three cars bring something different to the table. 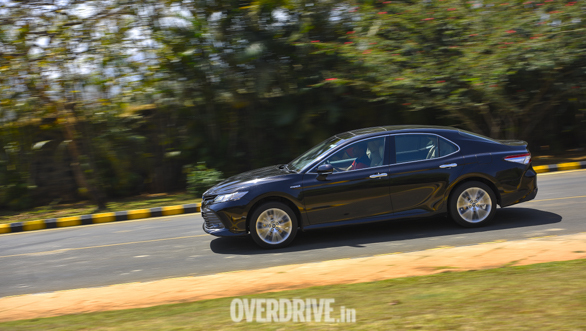 The Camry has lost the plain, slightly bulbous look of its previous generations and is now much sharper. Its low Lexus-esque nose is dominated by the wide, multi-slatted bumper and the sharp, slightly upset headlamps. It's the biggest car here but also manages this size better. We loved how the character line rises from the side of the bonnets and flows into the boot via the indent on the C-pillar. The Camry's wide wraparound tail lamps and 18-inch wheels further add to its squat, sporty look. The Superb, conversely, is closest to the mold of a traditional limousine. The heavily detailed headlamps are striking but from then on its all understated elegance. The butterfly grille which transforms into the bonnet creases, the long-wheelbase with a mild crease that runs along the window-line and slightly squared of rear-end all make the Superb appealing to someone who wants the stature these cars provide but with none of the flashiness. The Passat is following a middle ground. It has that sense of calm, German luxury but is peppered with bits like the lowish nose and more prominent lines. The unique LED light-signature to the tail lamps bring carry on that mild aggressive to an otherwise sedate rear-end. This means that choosing one car's looks over the others is difficult, it's more a choice based on personal taste. Step inside and there's more to differentiate these cars. The Superb feels a bit too mainstream. 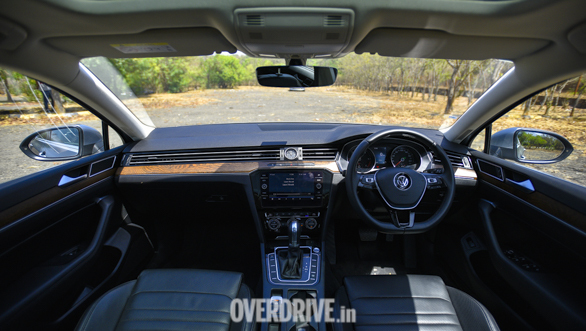 The layout and colours remind us of lesser Skodas, a feeling accentuated by the small infotainment screen and MID. But it claws back substantial ground, in typical Skoda fashion, by being the most spacious at the back. The light beige colour suddenly bringing a sense of airiness. 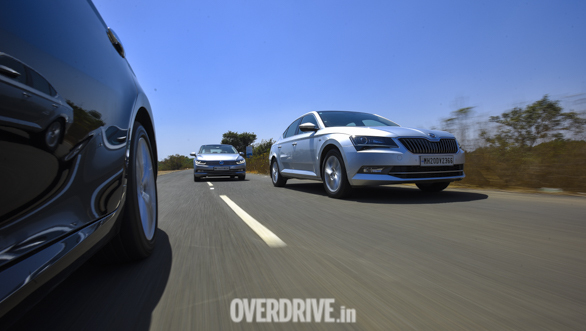 MQB siblings as they are, the Passat shares much of its switchgear with the Skoda. What's different is the black and faux wood trim. This brings a sportier vibe, the flipside is a rear seat that feels smaller and slightly more hemmed in than it is. 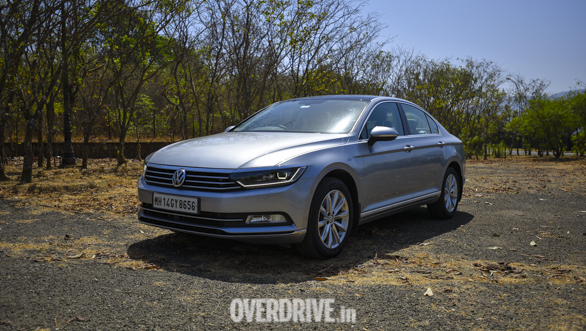 Other things we liked on the Passat was the much more advanced infotainment system, the best here with its quick responses and easy functionality. The Camry's rear seat strikes the best balance. The seats are softer and more supportive than the others. A big advantage is a reclining function. 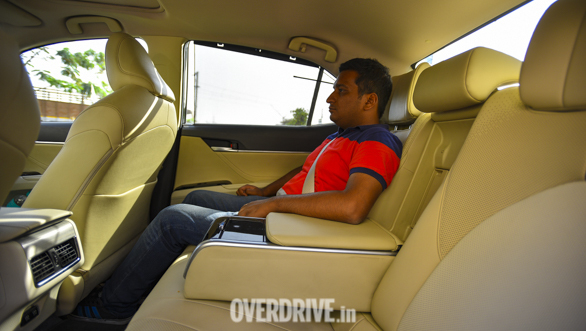 Further, the armrest has functions to control the rear climate control and audio, bringing more premium-ness. The Camry loses out on panoramic sunroof but it's not something you miss for very long. All of this makes it a cosseting space. The Camry's space-age styling finds its way to the front as well. The dash has multiple surfaces and textures and an asymmetric center console. Hearteningly, this isn't at the cost of outer visibility. The Camry's infotainment gets navigation but is the most basic and tedious to use. Respite comes from the full-color MID and HUD that provides loads of info to the driver. We especially liked the diagram which shows real-time how the hybrid powertrain is functioning. A letdown is the materials used. There's more plastic than we would have liked, including on touchpoints like the door latch. All three cars allow for a good low-slung driving position, so whenever you decide to send the driver home early you won't be disappointed. It's easier in the Camry with its power adjustable steering column, in addition to the eight-way power seats that are on all three cars. But the Passat and Superb allow being placed on the road better. The Camry's long hood and protruding nose take some getting used to. As is expected of cars at this price, safety is well taken care of. The Passat is the best at this with its added 360-degree camera. All three cars get front passengers, side, rear and curtain airbags. The Superb is the only one that's missing a driver knee airbag. Other than this all cars get tire pressure monitoring systems, traction control, hill descent control, and electronic parking brakes. It's a classic old vs new story. The Passat and Superb are what traditionally we've liked our luxury saloons to be. A torquey diesel motor paired with a seamless automatic. The Camry, a perfect example of what these cars will be like going forward. Both the Superb and Passat get VW's 2.0-litre TDI motor. This motor makes 177PS at 3,600-4,000 rpm and 350 Nm at 1,500 to 3,000 rpm. The engine, like it has always been, is refined and linear in its power delivery, if slightly noisy. Paired with the six-speed DSG, the engine is always in the gear you want to be in and shifts are all but imperceptible. But our testing showed up some surprises. 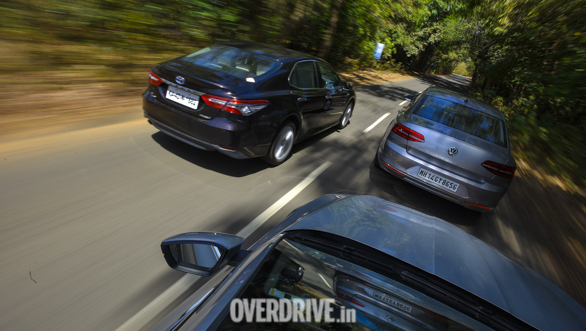 The Superb is the quickest to make the 0 to 100kmph run, getting there in 8.1s. 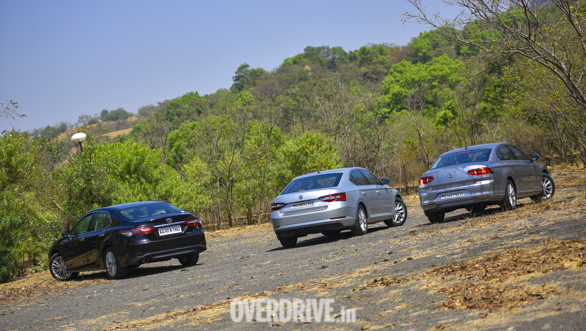 The Passat does this in 8.5s but feels sportier doing it, due to its shorter gearing. The Skoda seems more effortless though and is more fuel efficient too. 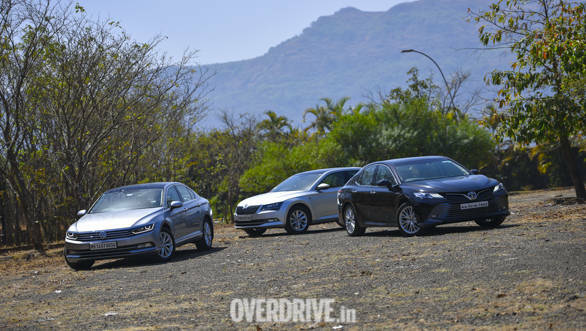 The Superb returns 13.52 kmpl versus the Passat's 12.31 kmpl. In this company, Camry's total system output of 218PS at 5,700 rpm and 221 Nm at 3,600-5,200 rpm may look a bit outgunned. But Camry has reworked the hybrid setup extremely well. 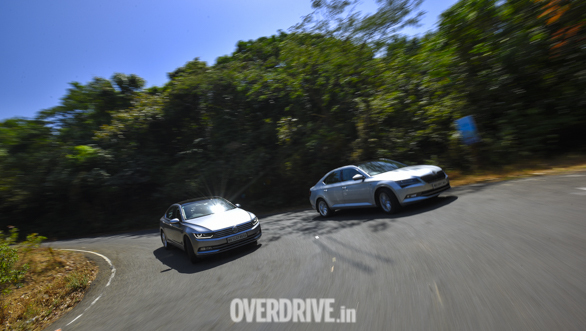 The initial shove from the electric motor is addictive and the CVT, one past the slight rubber-band effect when the engine starts to take charge, makes the 8.6s run to 100 kmph the most exciting. Contrary to the set image of hybrids, the Camry is an effortless highway cruiser too. 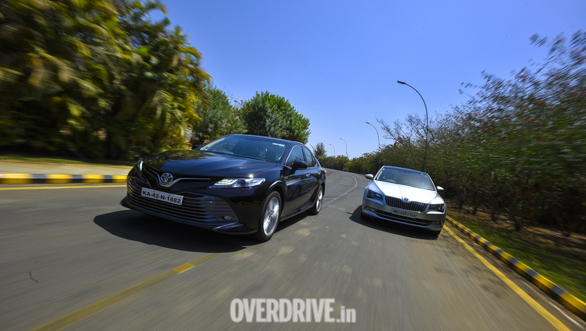 The electric motor fills gaps in the petrol engine's powerband to make the Camry seem like it has the unrelenting, diesel torque wave that we so like in the Passat and Superb. 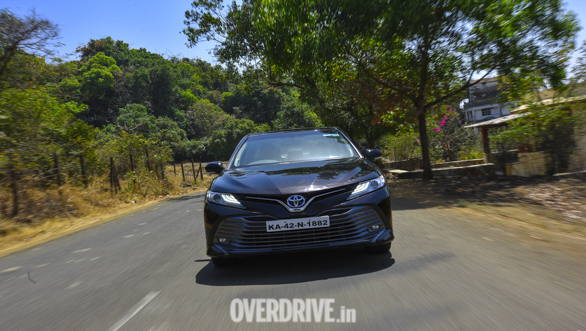 In the city too, the electric motor's immediate torque gives the Camry an edge, we could exploit gaps easier than in the diesel cars which took some time to wake up. These varied attributes are then topped by its 16 kmpl economy figure and the near-silent operation of the hybrid powertrain. 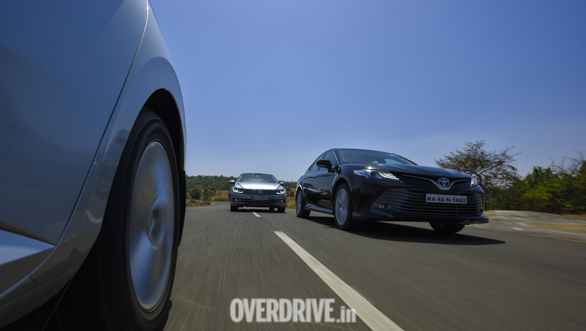 The Camry's suspension setup sets new benchmarks in the ride and handling department. The suspension absorbs most road imperfections at all speeds. It's also silent while doing this, feeling like a rung above the typically European setup that the Passat and Superb come with. Both these cars crash over bigger bumps and ruts. The small to mid-level bumps are well taken care of, but the cars still let you know that they're working hard to do this. The Superb, with its softer suspension setup, is marginally better than the Passat. It's so good because even through a section of twisties, the car stays flat and composed. There's seemingly no compromise. The Passat is also fun, mainly because of its more communicative steering, but body movements aren't as well controlled. 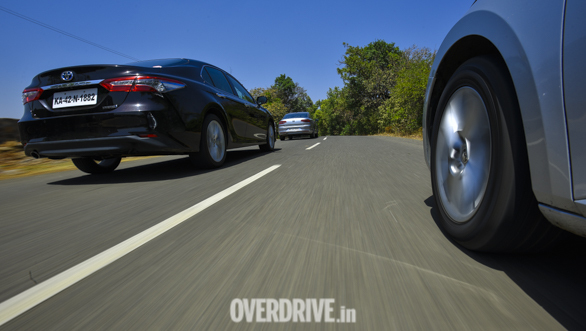 The Superb's softer suspension and lighter steering set up make it one for highway cruising. All three get drive modes which range from Eco to Sport. These essentially change steering heft and shift points according to the level of involvement you want. 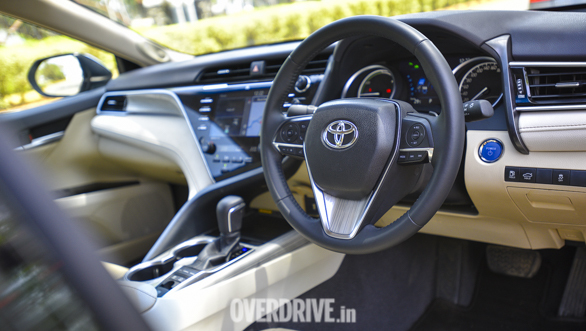 At Rs 44.09 lakh, the Toyota Camry Hybrid is the most expensive car here. But the roughly three lakh premium over the Superb's Rs 40.71 lakh and Passat's Rs 40.22 lakh seems justified to us. It's much more efficient, is a generally larger car, gets some nice touches inside and is the most fun. The Passat and Superb fall behind by a whisker. It's mainly because their diesel powertrain and suspension setup do not feel as well adjusted to our conditions. But, they bring great value. Prices for their base variants start at just over Rs 30 lakh and both come with very strong warranty packages. So you won't really go wrong with any one of these. It's just the compromises you make may differ. The Camry wins because it asks you to make the least amount of these compromises. Which also happens to be a great measure for luxury.